Blessed Mary lived, cared for by St. John, for twelve years after Our Lord’s Resurrection. Her life was spent in helping the Apostles and in praying for the conversion of the world. 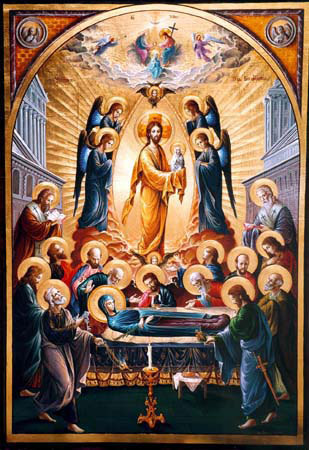 On the third day after Mary’s death, when the Apostles gathered around her tomb, they found it empty. The sacred body had been carried up to the celestial paradise. Jesus Himself came to conduct her thither the whole court of heaven came to welcome with songs of triumph the Mother of the Divine Word. Why was Mary’s body received into heaven instead of remaining in the earth, like the rest of mankind? The grave had no power over one who was pure. Her flesh could not see corruption. Her body had been over shadowed by the Holy Ghost. It had been the sacred temple in which had dwelt God Incarnate, and so it had a claim to ascend whither the Body of her Son had already gone before. But the chief reason was that as she had shared in each detail in the sorrows and agony of her Son, so it was right that she should take part in His triumph. Let us ask of God, through Mary’s intercession, the grace of a happy death.